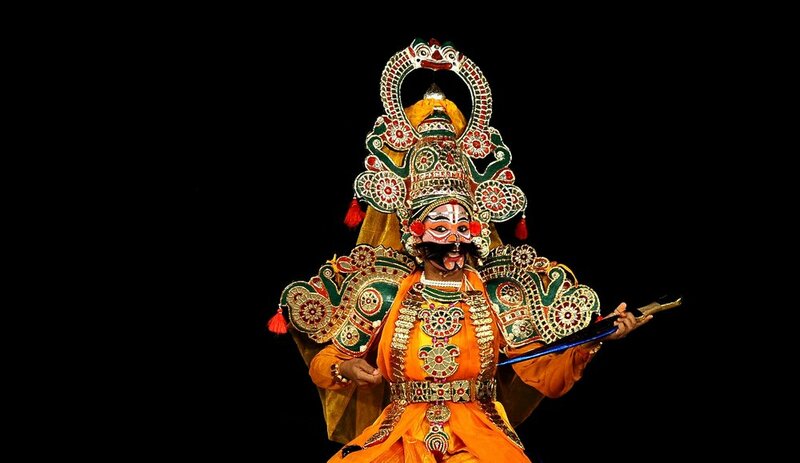 The repertoire of the Kattaikkuttu Young Professionals Company consists of traditional Mahabharata episodes, such as Draupadi’s Marriage, Royal Sacrifice, Dice and Disrobing, Draupadi-the-Kuratti, and Karna Moksham. Some of these traditional stories have been reworked by P. Rajagopal to better flash out their core narrative, adding songs to it and sometimes new characters or scenes. The Young Professionals are able to present these plays in their all-night form and in condensed versions of one to two hours duration. The availability of plays in the repertoire depends on the level of training of the Company’s current members. This level changes with the in- and outflow of young people into or out of the Gurukulam. P. Rajagopal has written a number of new plays for the members of the Kattaikkuttu Young Professionals Company. These new plays often question social issues. They often feature talented female students in major female and male roles offering Kattaikkuttu’s first ever professional performers to have their voices heard and their presence felt.